I recently released the 2nd review from SBC’s 2018 Best Tipster Guide, focusing in great detail on one of the very best tipsters my review team and I have ever had the pleasure to examine. But exactly what is it that the SBC review team (and therefore you) should look for in a tipster? And what qualities does a tipster have for us to enter it into our Best Tipster Guide? To help answer these questions, today I want to explore the anatomy of a profitable tipster with 5 KEY pointers for you to consider when weighing up whether a tipping service is for you or not. Just like football managers, tipsters live and die based upon the results they achieve. If they don’t make a simple profit for you (over and above the cost of joining) then there really is no point to them. Once there is a profit to view, then its also important that it is both relatively consistently achieved and realistic. You would be amazed at how many ‘profitable tipsters’ are nothing of the sort on this front. For example – I recently explored a tipster with on the face of it a profitable record from over 800 bets, yet by digging into their results I found this record was massively skewed by a 200/1 winner. The profits from that 1 bet aside, the service had made a combined loss from the other 799 bets! Contrasting with this, our Best Tipster Guide (BTG) expert has a consistent, long-term record with a profit from each season active. Some seasons higher, some lower but each profitable and an average seasonal profit of around 45 points. This general consistency is further backed up by the profit graph below that is useful as we can see any spikes (like a 200/1 winner) that might suggest problems. Beyond a small plateau between the 600 and 700 bet marker, its been generally smooth upward progress for our BTG expert. When a tipster has a profitable strategy, one other simple way they can maximise this is through a staking plan. The theory here is that you should stake more when there is greater perceived value from a tip and less when the opposite applies. Once again our BTG expert ticks these boxes and by viewing their staking plan, we can see how the greater the amount staked, the greater the ROI. For example, the smaller staked bets (0.25 points) return a 16.8% ROI, whereas the maximum staked bets (1.5 to 2 points) hit a 38.8% ROI. Proof positive this expert knows where the value lies as the greater you stake, the greater your profit. In today’s modern betting world, we must also be aware of the issues we might suffer in trying to get our bets on. Bookmakers shift prices very quickly at the smallest sign of shrewd money on a racing bet, especially those placed early away from the big race meetings. Even if you do manage to obtain a good price for your bet, if it should win and especially if it shortens in price dramatically before the off, you run every chance of suffering a bookmaker account restriction or closure. Which is why its important to follow a tipster that takes this into consideration. If they are putting up a 33/1 hot racing tip at 6pm the night before racing and not accounting for any price movement should the odds be slashed, its a problem. Again though, our BTG expert leads the way here with a policy of only tipping in big races, when markets are already formed and when you are able to back them easily in shops. “Whenever I issue a tip now, it is my belief that it is possible for people to back it in bookmaker shops, should they choose to do so. So, if I issue a tip the day before a race, it will be in races which are generally priced up at that time; whilst those tips issued in the morning, are only issued when shops are open and the horses can be backed within them. I’ve actually got a few guys in the service who do exactly this (they have no online accounts) – and they achieve around 90% of the prices by backing in shops. This also means that the prices of all the tips are relatively robust, because the markets have some maturity. Therefore, it should be possible to back the horses at (or close to) the price specified an hour or so later both with bookmakers and on exchanges. Leading on from this last point – if you are restricted or shut down by the bookies, then the best route open to you is that of betting exchanges. Smarkets, Matchbook & Betdaq are all now improving, low commission alternatives to Betfair and offer a genuine route to punters unable to bet with bookies. Exchanges allow you to win as much as you want and won’t shut you down. They welcome your business, even if you are a winner. Best of all, our BTG expert is one you can follow on the exchanges with only a 2.6% ROI drop (after exchange commission) from the sample of data we gathered following them with Smarkets. So rather than obtaining the 30.1% ROI as seen in my first point, you might instead make 2.6% less = 27.5% ROI. Still a very strong edge. Last but not least, there are some sensible things any good tipster will think about – namely the price and how and when they supply tips. The cost of any tipster should be reasonable and will allow you to make plenty of profit beyond it. The profit also should be within your reach to make a profit without staking at huge levels. 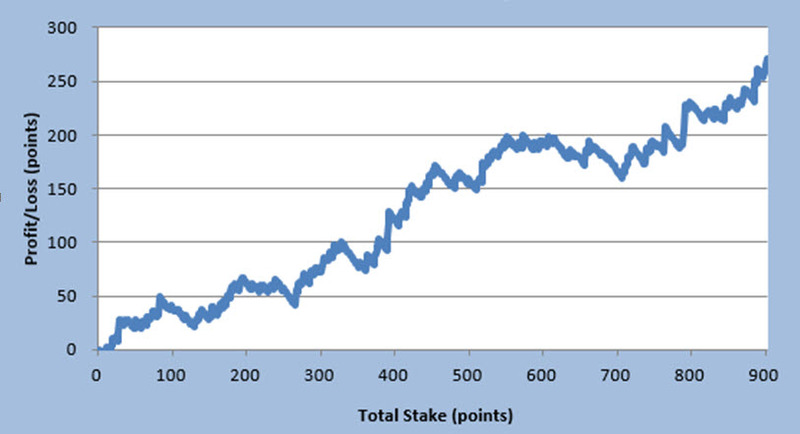 Our BTG expert charges just £250 for a full NH season and averages around 45 points profit each time out. Even a simple £50 per point strategy would see you make around 10X the cost of joining in an average season. Its important to also have a clear understanding of how many bets are supplied by the tipster and when they are sent on. If tips come through at random times with no warning then realistically how are you going to be setup to follow them properly? They might send them at 10pm one day and 10am the next. If you need to get on them quickly then you will often miss out on value altogether. Again, the BTG expert ticks the boxes here as he uses three possible tipping windows: 17.00-18.00 the evening before racing, 8.30-9.30 am, and 11.00-12.00am. You know therefore when to look out for possible bets and when exactly they might be heading your way. Hopefully these 5 key points will help to guide you towards those genuinely profitable tipsters that can help you make money betting. There are naturally more than just 5 points to consider for every tipster but the 5 above are some of the most important and where many punters are unwittingly caught out. Reviewing and tracking tipsters is what we do best here at the Smart Betting Club – having been at the heart of the industry since 2006. For those of you after more information on our service, you can read about our tipster review process here and crucially our 100% independent stance. More details on the Best Tipster Guide can also be found here. This is because we have slashed the price of joining to ensure as many people as possible have access to our reports, magazines and guides. Yesterday I published my interview with the SBC member up £4,200 in just 2 months from following some of the top tipsters recommended by my team here at the Smart Betting Club. And to further showcase how easy it can be to make money betting, today I have more evidence of the profits being made following tipsters by SBC blogger, Rowan Day. Rowan writes about the tipsters he follows on the free Bet Diary blog and inside his latest interim report (which you can download below), he writes about the exact profits made so far this year. The good news is that its been another profitable year for him….Providing yet more evidence (were it needed) that the top rated tipsters we recommend are well worth following. Click the link below now to read his latest report on the profits he is making! Rowan’s simple and easy to follow tipster portfolio has been reaping great dividends ever since he first began writing about it on the Bet Diary in April 2015. Since then, from this low-maintenance set of tipsters, he has made a total of 159.55% Betting Bank Growth and accumulated some excellent profits along the way. The 159.55% figure is of great interest as it indicates just how a betting bank will have grown in relation to these profits. If for example, Rowan began with £2,000 in April 2015, then 159.55% growth would have made him a £3,190 profit by the end of October 2017. So whatever size bank you start with, there is an exceptional return available to you. Whatever your background, experience or thoughts on tipsters – we know that here at the Smart Betting Club, our reports and reviews can make a difference to your betting bottom-line. Helping you towards the goal of making money betting with tipsters. If you want to read more from Rowan, then for the past 2 1/2 years, he has been writing a free weekly betting blog called the ‘Bet Diary‘ for SBC, through which he has outlined the ongoing profit (and occasional losses) the tipsters he follows have made. Rowan follows just a handful of tipsters, which are a mixture of horse racing, football and golf tipsters that suit him and his commitments. Its just one, very useful example of how with the right information you can beat the bookies (or exchanges) long-term. Updated weekly, check out the Bet Diary for the latest from Rowan. Sign-up now and get started with instant access. Earlier this week saw the release of the very latest SBC Tipster Profit Report, featuring updated tipster league tables, tipster ratings and recommendations on the best betting experts to follow in 2017. Did you know that for each of the tipsters we report back on, you can also find a dedicated ‘Key Facts’ tipster ratings page, which provide unique and informative ratings on everything they offer? Whether it be the profits a tipster is making, how much they cost, how patient you might have to be if following or even just how achievable their advised odds might be – we regularly update these tipster ratings to keep you fully up to speed on just who the best (and sometimes worst) tipsters actually are. My team and I rate each tipster we monitor on 10 different aspects of the service they offer. This is based on a scale of 1 (very bad) to 5 (very good) and we constantly update these ratings to ensure they are relevant. Returns (AKA Profits! ): This is always the first rating we supply as ultimately a tipster is only as good as the profits it can make you. The greater the profit, ROI or betting bank growth, then the higher this rating will be! Risk: There is always an element or risk in following any tipster, yet for some the level of risk is greater than others. For example, a tipster with only a 1-year history of profitable tips is in essence a riskier proposition than a tipster with a 5-year profitable record. Equally a tipster that chops and changes strategy every few months is going to rate poorly compared to an expert with a more settled method. Our risk rating communicates exactly how ‘safe’ your money might be when following a tipster. Cost: Exactly how much does a tipster charge and how does that compare with others offering a similar service? The cost rating rewards those offering the best value for money service and helps you find the best, more affordable expert. Odds Availability: For many tipsters, especially those supplying racing tips, odds availability is a critical tipster rating. After all, if you as a potential customer of a tipster are unable to obtain the odds they claim, then there is little reason in following them. We base our odds availability rating on the in-depth odds tracking we perform in each review we publish. This odds tracking gauges the individual price movements of any advised tip over time (e.g. after 15, 30, 60 minutes) and compare it to the results the service utilises. The easier it is to obtain or improve on the settled odds, the greater this rating and appeal to you as a potential member of their tipping service. Transparency: With this rating, we relate just how open and honest a tipster is. For example – do they publish accurate and detailed results on their website or do they keep them hidden from view? Transparency and openness is key in the tipster industry. Customer Service: We also keenly observe the customer service experience you might receive if a member of any given tipping service. How quickly do they reply to emails and how do they treat you as a customer? This rating outlines our experience and understanding of the quality of service on offer. Suggested Portfolio Weighting: Should you choose to join a tipster, exactly how much money and what proportion of your betting bank should you apply to them? This rating outlines our recommendation, based on our overall confidence in the service and the strength of our ratings. Patience: How long might you need assign in terms of time to ensure a clear profit from following any given tipster? Our patience rating outlines this and is based on the profile of the tipster, their historical record and the odds/strike-rate they operate to. Points Betting Bank: For each tipster we analyse, we also suggest the size ‘points betting bank’ we advocate you use to maximise your profits. This is designed to cover potential losing runs and maximise winning runs without ever going ‘bust’! Its all part of the money management advice we provide to help you make the most from your betting. Recommendation: Our final rating provides an overall guide to the recommendation we currently apply to any tipster. The higher a tipster rates and the longer it has been in service, then the greater the recommendation for you to purchase a subscription with them. Strong Buy – We fully recommend this service as one to follow. Speculative Buy – We recommend this service although with some noticeable caveats, which can be observed in their SBC review. Hold – If you have a current subscription to this service, we recommend you continue to follow. Those of you without a subscription to the service, should not start following. Watch – A tipster we need to observe further. We do not recommend anyone joins and if you do have a subscription, we recommend you proceed with extreme caution. Sell – We do not currently recommend. If you hold a subscription, we recommend you stop following. All the ratings when combined can help provide you with a fully informed view of just who the best tipsters might be to suit your preferences. Maybe you simply want to join the tipster with highest profits – the returns rating is what you need. As we list 10 ratings for each of the 57 tipsters we currently track – in total you can currently access 570 different ratings as an SBC member. More than enough to help you find the right tipster for you! To help you even further, we also put the very best tipsters in our ‘Hall of Fame’, which is our regularly updated list of top tipster recommendations. Best of all, as the Smart Betting Club is 100% member funded, all our ratings and Hall of Fame recommendations are totally independent and affiliate/kickback free – unlike almost all other ‘tipster review’ websites. We accept no payments or rewards for penning favourable tipster reviews. So if we say a tipster is good, it’s because they genuinely are, not because we have been paid to say so! Up To £35 On An SBC Membership! You can pick up your copy of the latest Tipster Profit Report and access all of our tipster ratings, the instant you join our service at the Smart Betting Club. You can also now join and save up to £35 as part of our specially discounted 2017 membership prices.